RABBINIC TEACHING on ISAIAH 53 has been kept hidden… that God has a Son who came as the Suffering Servant Messiah to die for Israel’s sins! The religious Pharisee sect KNEW from prophecy the very day Messiah was due to appear to Israel…they kept it hidden and Yeshua rode into Jerusalem through the East Gate on that very day with the crowds waving palm branches, singing and welcoming their King Messiah… yet they rejected Him and had Him crucified! Jewish Rabbis are still hiding the prophecy in Daniel 9 about how the Messiah would be “cut off” before the Temple would be destroyed.This happened in 70 AD. So the Messiah has already come 2000 years ago. Yeshua also prophesied this destruction of the Temple in Jerusalem. IMPORTANT PROPHETIC INFO REVEALING OLD SECRET JEWISH TEACHING ABOUT WHO ISRAEL’S MESSIAH WOULD BE AND THE TIMING OF HIS APPEARING BEFORE THE TEMPLE WOULD BE DESTROYED IN 70 AD ACCORDING TO ISAIAH 53 and DANIEL 9… The old Jewish sages said the LORD would reach under His Throne and bring forth His Son and ask Him would He consent to go down to earth as the Messiah and die for Israel’s sins? This is amazing since Judaism generally denies, because of the Shema, that God who is pure spiritual Light has a Divine Son or manifestation / emenation of Himself, whom He appears and speaks through… yet they know YHVH personally appeared to Moses in the wilderness as the Angel or Messenger of the LORD for “His Name was in Him”. Sh’ma Yisrael, Adonai Eloheinu Adonai Ecḥad – Hear, O Israel: the Lord is our God, the Lord is One”. Echad” means “One” but in a mysterious spiritual “plurality” as a married couple or a congregation can be said to be “one”. Maimonides noted the strength of “yachid” (to mean only one) and chose to use that word in his “Thirteen Articles of Faith” in place of the word “echad”. However some Jewish roots teachers have realized Moses did not write “yachid” in Deuteronomy 6:4… so the place of Yeshua in the spiritual I AM YHWH Godhead has been kept hidden from Yeshiva students and Jews in general and only revealed through the New Covenant. The Son has NOT been known as the emanation or “image” of YAHVEH, who has been with the Father and the Spirit, from the beginning, from before the creation of the worlds and in whose image we were made… being the One who incarnated as the man Yeshua on earth! Proverbs 30.4 says I AM YHVH does have a Son….“Who hath ascended up into heaven, or descended? who hath gathered the wind in his fists? who hath bound the waters in a garment? who hath established all the ends of the earth? what is his name, and what is his son’s name, if thou canst tell?” Also Psalm 2:12“Kiss the Son, lest he be angry, and ye perish from the way, when his wrath is kindled but a little. Blessed are all they that put their trust in him”. Also Genesis 1:26 says the Elohim said, “Let us make man in our image after our likeness”. AT THIS POINT… before I get to the info about an amazing free eBook I found… I AM SHARING THIS EXTRACT about more unorthodox and unusual Jewish thinking regarding what Christians usually call the “Trinity”! In other words it’s not a pagan idea at all but one hidden in Hebrew scriptures and teachings and you will find many interesting though often conflicting teachings on this subject if you care to study it further. QUOTE: The Zohar, the foundation book of Jewish mysticism, recognized that the idea of a plurality-in-unity is not foreign to Jewish thinking. While the medieval mystics’ idea is different from the Christian idea of the Trinity, the basic idea of a plurality within the one God still holds. The passage from the Zohar, commenting on the Sh’ma, reads as follows: “Hear, O Israel, YHVH Elohenu YHVH is one.” These three are one. How can the three Names be one? Only through the perception of Faith: in the vision of the Holy Spirit, in the beholding of the hidden eyes alone. The mystery of the audible voice is similar to this, for though it is one yet it consists of three elements–fire, air, and water, which have, however, become one in the mystery of the voice. Even so it is with the mystery of the threefold Divine manifestations designated by YHVH Elohenu YHVH–three modes which yet form one unity. Lord Yeshua said in the beautiful Book of John that He was in the Father and the Father was in Him and that they were One (echad) and that those who love the Father would accept Him and that we would all be One (echad) through the Holy Ruach Spirit as Elohim / Sons of the Most High God! There is a great family redeemed by the blood of the Lamb from all nations that the Father has desired for Himself… to fill His House and from them is being chosen a faithful, remnant Bride who love His Son and will be with Him forever on the Heavenly Mt. Zion. HALLELUYAH… how great is our God and the “mystery of Godliness” that He is bringing forth! Galations 4:6,“And because ye are sons, God hath sent forth the Spirit of his Son into your hearts, crying, Abba, Father”. THIS SHOWS THAT THE NEW COVENANT… IS ABOUT THE REVELATION KNOWLEDGE BEING GIVEN OF THE SON OF YHVH… as YAH-SHUAH or YAH is our salvation…Isaiah 63:5“And I looked, and there was none to help; and I wondered that there was none to uphold: therefore mine own arm brought salvation unto me; and my fury, it upheld me”. The arm, or extension of the LORD was seen by His disciple John in His present Glorified “I AM” state in the Book of the Revelation Of Jesus Christ! The truth of ISAIAH 53 has been hidden for so long… that the Messiah would first be “a man of many sorrows”, rejected by His own people and die as the Suffering Servant… before coming in Glory and being accepted as their ruling King Messiah. More can be found on these original Jewish concepts of the expected Messiah in a PDF file by Rabbi Simcha Pearlmutter. There is so much excellent prophetic revelation in this online teaching book and I pray you will be blessed and thrilled to find it! Truth… and the Wisdom in the LORD it brings… is so valuable in these last days for all who love the LORD GOD OF ISRAEL & HIS MESSIAH… *UPDATE AS OF 9th February 2019… The link I had given here to Rabbi Pearlmutter’s teaching was on his website but sadly he has passed away. So I will try and find a link to it elsewhere and add ASAP. AND you may be interested in the Link below to this site… just to learn what our Messianic Jewish brothers and sisters teach and believe about Lord Yeshua as their promised Messiah… other than the many faceted “Christianized” and Denominational side of things from converts to Christ in all the other nations! He is the Messiah of Israel and a Light to the Gentiles… who are grafted into the Olive tree by entering into the New Covenant with Him. AND Go here to search various outlets including Amazon… https://www.bing.com/search?q=The+Great+Mystery+or+How+Can+Three+be+One%3F+by+Rabbi+Tzvi+Nassi&pc=MOZI&form=MOZCON for a small book to buy which I have. Originally written by a Jew in 1863 after he became convinced by Rabbinical teachings, written prior to Yeshua’s coming to Israel… that Yeshua / Jesus was the Messiah. The Great Mystery or How Can Three be One? Rabbi Nassi expounds ‘passages from canonical Rabbinic writings that clearly show a belief in the tri-unity of God amongst the Jewish scholars, before the Christian era and up until about a century after the destruction of the second Temple.’ Includes passages from the Targums (ancient paraphrases of the Hebrew Scriptures) that reflect belief in the plurality and the tri-unity of the Godhead. ‘The Great Mystery’ by Rabbi Tzvi Nassi, is printed by Keren Ahvah Meshihit, Jerusalem. ALSO>>> this extract from the Zohar 2:43… which shows how Rabbis hid these pre Christian concepts and revelations of YAHWEH so as not to give any credence to the teachings of Jesus Christ who said He and the Father were One! How can they (the three) be One? Are they Truly One because we call them One? through the revelation of the Holy Spirit. Please go to my other website http://holyfaithofyeshua.wordpress.com to see more of how the prophetic scriptures about the life, death and resurrection of Messiah were fulfilled by Yeshua, especially Isaiah 53 which today’s Rabbis and Torah students hotly dispute is talking about a particular “man” as the suffering servant. They are still blinded to this truth… that YAHVEH became their Salvation… YAH – Shuah… claiming the passage is about Israel as a nation… yet it defies belief. These videos of Sid Roth conducting a debate between Dr. Michael Brown and Rabbi Schmuley Boteach shows how strongly they justify their position in opposition… This is part 1 and you will see the other 3 following on. Dare anyone overlook Yeshua as God’s Beloved Son any longer? He has already started pouring out the New Covenant promise of the Holy Spirit 2,000 years ago. Just accept Yeshua as your Lord and Savior and ask Father YAHVEH to fill you with His Ruach Spirit of Love and Power. Let me know what happens! Thanks so much for your comment. Did you see the PDF file I mentioned? 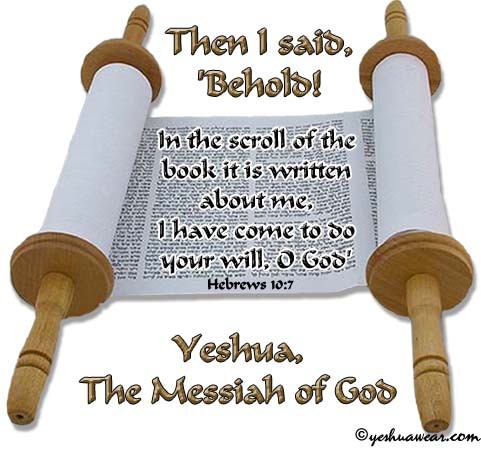 The deity of Yeshua is a mystery but I see He called Himself “I AM” in the Book of Revelation! Therefore he is the Holy One who revealed Himself to Moses… therefore He is the Elohim / God of Israel… Who came in human form as YAH-SHUA… YAHWEH their SALVATION. And to be a Light to the Gentiles as well. The pure in heart will see Him eventually in the Holy of Holies as YAHWEH the Father of Lights. He is also the Ruach Holy Spirit who has come to us as YAHWEH the indwelling Comforter and Teacher and Who anoints us with power and authority for ministry in His Name.. The fullness of the Godhead was in Him bodily. Truly it is wonderful and yet we can barely understand it… only accept it. Amen. Blessings from Susan. Thank you very much for taking the time to leave a comment. It’s nice to get the feedback and assurance that someone out there is blessed and encouraged! Kind regards in Yeshua our Lord from Susan.